Disclaimer: I received Legend Compression Performance Socks to review as part of being a BibRave Pro. Learn more about becoming a BibRave Pro (ambassador), and check out BibRave.com to review find and write race reviews! Have you ever worn compression socks? Do you use them for fashion or for function? I only have a couple pairs of compression socks but my favorite way to use them is for recovery! After a tough run, there’s nothing better than slipping on some compression socks and letting the healing process begin! That’s why I was excited when Bibrave provided the opportunity to try Legend Compression Performance Socks. Keep reading to check out my experience with wearing the socks! I’m linking up with Susie, Debbie, Lora, and Rachel for the Running Coaches Corner, Annmarie, Nicole, Jen, and Michelle for Wild Workout Wednesday, and Ilka and Angela for Sunday Fitness and Food linkup,! Check out their sites to find new workouts to try and lots of great running and fitness tips! If you’re a newer runner, you may have never realized the benefits wearing compression socks. I know that I had no clue about them when I started out 5 years ago! Now I find them to be a great complement to my running routine. Helping recover overworked muscles. In addition to properly hydrating and fueling, I love to wear compression socks after a tough run. Compression gear stimulates blood flow and can help prevent muscle tightness and soreness. There are different types of socks and sleeves on the market that you can wear depending on your needs. Helping to reduce lower leg pain/soreness/tightness while running. Have you ever dealt with shin splints? Calf cramps? You may consider my experience anecdotal, but I have found that wearing compression socks has eased shin pain that I’ve had in the past. Compression has also been shown to help if you have had ankle or foot issues like plantar fasciitis. Looking cool! Believe it or not, there have been studies about how wearing fashionable gear while working out can increase your confidence and boost your performance. Do you have a certain outfit you wear while running that makes you feel or even run faster? Compression socks can have that type of benefit, especially if you get them in a variety of colors! Coach Debbie Runs has a great article on the benefits of wearing compression socks that I highly recommend checking out! Legend Compression has a broad range of compression products available, and not just for athletes but for everyday use. The Performance Socks work great for runners, cyclists, team athletes, and even those who do Crossfit! All products are manufactured in the United States. I wore them to work after the Perfect 10 Miler! I’ve been wearing the Legend Compression Performance Socks for a couple of weeks now and I really enjoy them. They’re easy to put on and extremely comfortable. Normally I’m not a big fan of wearing compression socks while running because they can sometimes feel a little bit too tight – not the case with the Performance Socks. I had a nice run with them for about 4 miles and they worked great – they stayed in place and added a little color to my running outfit. But I’m a bigger fan of wearing compression socks for recovery. 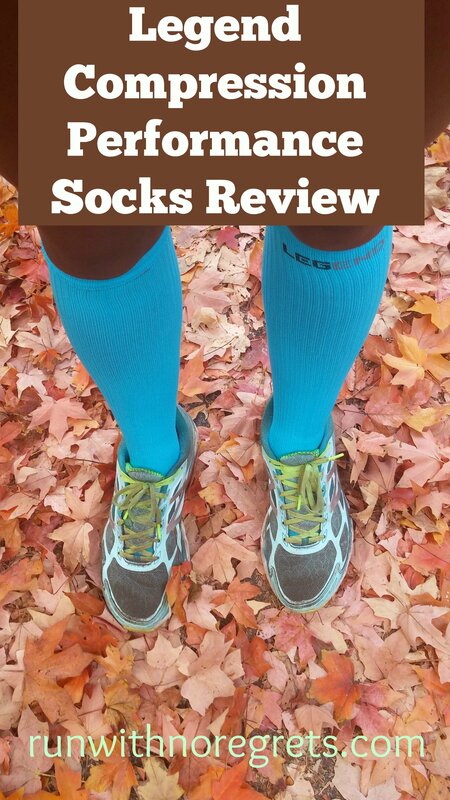 Since I really pushed myself at the Perfect 10 Miler, my legs were craving compression the following day – so I wore the Legend Compression socks to work! It really made a difference. And when I ran my 20 miler as part of training for the Philly Marathon, I made sure to grab the Legend Compression post-run to help soothe my achy legs. For the first time on that run, I experienced calf cramping and my feet weren’t that happy with me either after pounding the pavement for nearly 4 hours, so they needed the TLC! I was pleased to see that the Performance Socks did a great job! Legend Compression Performance Socks are high-quality and have done a great job of recovering my legs – extremely important right now as I’m training for my first marathon! If you’re a fan of wearing compression during your runs or overall as part of your training, I’d highly recommend giving these socks a try! I really don’t have any complaints since using the product these past few weeks! If you’d like to buy Legend Compression Performance Socks, just go online! Let me know what you think! Do you wear compression clothing during or after your workouts? Have you noticed any benefits?